Dance superstar Sylvie Guillem has revealed her final UK performance will be in Birmingham in the Autumn. Guillem will perform Life in Progress, which features both existing and new works by choreographers who have influenced her contemporary career. Following on from the Life in Progress' world premiere in Modena on March 31, two shows take place atBirmingham Hippodrome on Tuesday September 8 and Wednesday September 9, 2015. During the performance, Guillem will perform two new works including a solo by choreographer and Sadler's Wells Associate Artist Akram Khan, and a pas de deux with Italian dancer Emanuela Montanari from La Scala. The new duet is choreographed by Russell Maliphant with lighting by Michael Hulls, both of whom collaborated with her on the award-winning PUSH, which she performed at Birmingham Hippodrome as part of International Dance Festival Birmingham 2012. Life in Progress also includes Mats Ek's touching and poignant solo, Bye, which was made especially for her and has been performed previously as part of the 6000 Miles Away programme, which was part of International Dance Festival Birmingham 2014. The show is completed by William Forsythe's Duo, performed by two male dancers, which premiered in 1996. Renowned dancer Sylvie Guillem, who is the recipient of a special award at this year's Olivier Awards, has had a prestigious, extensive career. She has danced ballet at the Paris Opera Ballet, The Royal Ballet and Tokyo Ballet, to name a few, but also diversified as a dancer into the world of contemporary dance, performing acclaimed works such as PUSH, Sacred Monsters and 6000 Miles Away. Paris-born Guillem trained in gymnastics under the instruction of her mother, a gymnastics teacher, and moved on under the instruction of the Paris Opera Ballet School when she was 11. She was promoted to the rank of "Etoile" by Rudolf Nureyev at the age of 19. Her awards include the Officier de la Légion d'Honneur, Officier dans l'Ordre National du Mérite, Officier des Arts et Lettres, and, in Britain, an honorary CBE. Tickets are priced £15-£75 and can be booked online at the Birmingham Hippodrome website or by calling 0844 338 5000. 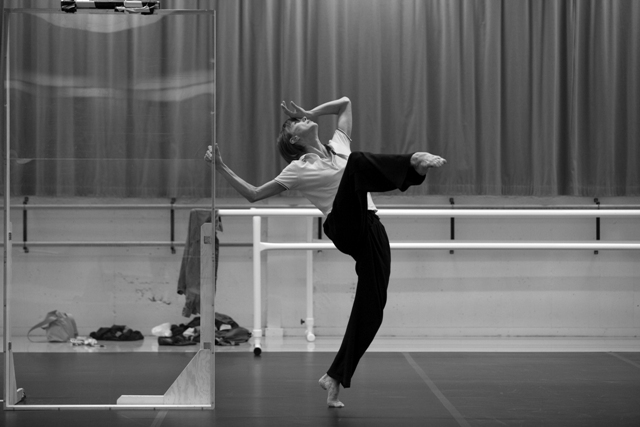 Life in Progress is co-produced with Les Nuits de Fourvière and Sylvie Guillem.